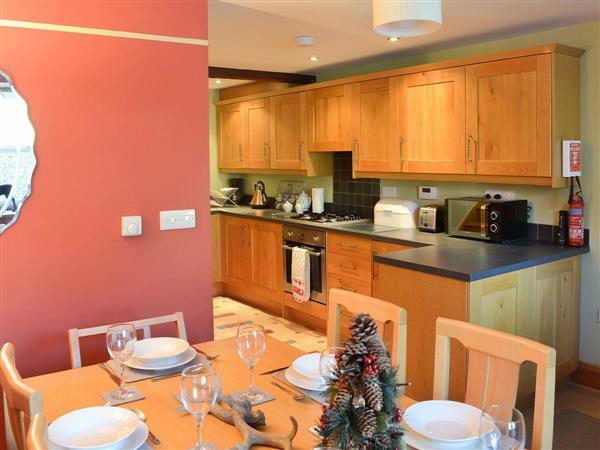 Biskey Burrow in Bowness-on-Windermere, Cumbria sleeps 6 people. Biskey Burrow in Bowness-on-Windermere has an ideal location close to the centre of Bowness-on-Windermere; this comfortable home is ideal for families who like to have everything on their doorstep. Laid out over three floors, this mid-terrace cottage offers contemporary living that hides behind the cottage’s traditional, stone clad exterior. You enter the property via a small porch, and then step down into a great open-plan kitchen/dining room, which is most definitely the heart of this home. A cosy living room with flat screen TV and DVD player is also located on this level, and there is also a cloakroom with toilet. On the lower level, you will find the master bedroom as well as the family bathroom and utility area which houses the washing machine and tumble dryer. On the first floor are two further bedrooms. Biskey Burrow is just a short walk from the heart of Bowness, which is one of the most popular towns in South Lakeland. The bustling town, which is frequented by locals as well as tourists, has a great selection of individual and unique shops, as well as a wide variety of cafés, bars and restaurants. There is also an old fashioned cinema and The World of Beatrix Potter Attraction, which families with children will adore. The shores of Lake Windermere, which is the UK’s largest lake, is also within a 10-15 minute walk. From here, you can hire a boat or take a leisurely ride on one of the old steamers. You can also take a boat cruise to Ambleside, or to Lakeside, where you will find the Aquarium of the Lakes and the Lakeside-Haverthwaite Steam Railway. The town of Windermere, which has a good sized supermarket, is approximately 1½ miles from Bowness. Windermere also has a train station with services to Kendal, Preston, Lancaster and Oxenholme. From Oxenholme, there are services to London, Manchester and Scotland, which makes this a very accessible location even for those who don’t want to bring their car. The surrounding fells offer plenty of walking, cycling and climbing opportunities, and thanks to the great road network, the whole of the stunning Lake District National Park is accessible, making Biskey Burrow the perfect base for your Lakeland adventure. The beach is 15 miles from Biskey Burrow in Bowness-on-Windermere. With the shop, pub and restaurant 200 yards from Biskey Burrow. Ground Floor: Biskey Burrow in Bowness-on-Windermere has a step to the entrance. Living room: With 40 Freeview Smart TV, DVD player and wooden floor. Kitchen/dining room: With electric oven, gas hob, microwave, fridge, dishwasher and wooden floor. Utility room: With washing machine, tumble dryer and freezer. First Floor: Bedroom 2: With double bed. Bedroom 3: With single bed and trundle bed. Gas central heating, gas, electricity, bed linen, towels and broadband included. Travel cot. On road parking. No smoking. Holidays at Biskey Burrow run from Friday to Friday. For a better idea of where Biskey Burrow is, you can see Biskey Burrow on the map below. Biskey Burrow is in Cumbria; should you be on the lookout for a special offer, you can find all the special offers in Cumbria. It's always worth checking to see what is on offer at the moment. Do you want to holiday near Biskey Burrow (UK1204), you can see other cottages within 25 miles of Biskey Burrow; have a look to find your perfect holiday location.